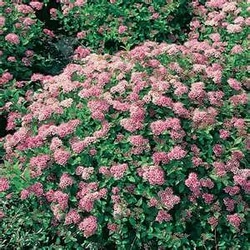 Little Princess Spirea is a dense, compact, rounded shrub with pink blooms from late spring into early summer. It will grow from 3' to 4' tall and just as wide. It has dark, blue-green leaves which turn copper and yellow in the fall. Little Princess Spirea likes to be planted in full sun. Use this shrub for a foundation planting, small hedge, or a grouping in a landscape bed. Little Princess Spirea attracts butterflies when in bloom. It is also deer resistant and is a Firewise plant.